To Fly is Everything ... does not receive any compensation or renumeration for these listings. These are a courtesy to our readers. Drawing upon decades of research, Simine Short has written the definitive biography of Octave Chanute. "French-born and self-trained civil engineer Octave Chanute designed America's two largest stockyards, created innovative and influential structures such as the Kansas City Bridge over the previously "unbridgeable" Missouri River, and was a passionate aviation pioneer whose collaborative approach to aeronautical engineering problems helped the Wright brothers take flight. 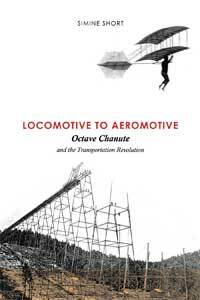 Drawing on a rich trove of archival material and exclusive family sources, Locomotive to Aeromotive is the first detailed examination of Chanute's life and his immeasurable contributions to the fields of engineering and transportation, from the ground transportation revolution of the mid-nineteenth century to the early days of aviation." The wait is over! Finally there is a first-class documentary on the Wright brothers and the invention of the airplane. I've seen the documentary, and the producer/director David Garrigus did an outstanding job. Buy your personal copy of Kitty Hawk: The Wright Brothers' Journey of Invention, and be the envy of everyone in your neighborhood! The documentary is a visual feast. Not only are innumerable photographs included, Garrigus has also incorporated contemporary reconstructions of Wright craft in flight, 3-D models of important phenomena, and narration by astronauts Neil Armstrong and John Glenn. Garrigus also relied on many expert aviation historians, including Drs. Tom Crouch and Peter Jakab of the Smithsonian, and noted biographers Fred Howard and James Tobin. Texas residents add 8.25% tax ($1.65) per order. The Festival of Flight Gift Shop has some handsome lithographs of Wright craft in flight. These have been restored from their damaged condition and look wonderful! "We are proud to offer these historic lithographs. 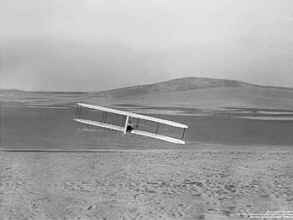 The original photos were taken 100 years ago with the Wright Brother's own camera. They have been restored to their original pristine state and printed in an archival four-color process on acid-free matte paper. Each lithograph print is 12" x 16" with an image area of 8 1/4" x 11", and includes a "shadow box" pseudo-matte printed right on the lithograph making matting optional. Just $18 each or a set of four for $65. S&H add $7.50 for one print. $10.50 up to 4 prints." Please feel free to send orders by email. We will reply with a listing of your payment options and the total order price including shipping. 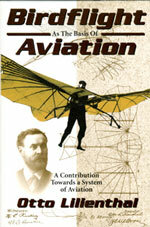 Aeronautical Publishers has released reprint editions of several important historical sources. 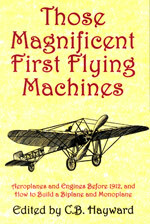 These include the English version of Birdflight as the Basis of Aviation, The Aeronautical Annual for 1895, 1896, and 1897, and a volume I am not familiar with, Those Magnificent First Flying Machines. My copies are all on order! Buy yours from Amazon.com. A company called "Fiddlers' Green" has some paper models of the Chanute Hang Glider, the 1902 Wright Glider, the 1903 Wright Flyer with catapult and workshop, and the Bleriot XI Channel Crosser. On the way are the Vin Fiz Wright model B Transcontinental Flyer and the 1895 Lilienthal Hang Glider. The 1902 glider model is free! Editor's note: I've run across some interesting products that people may be interested in. Please note that I don't sell this stuff. If you want me to list something, send email to glb2ATra.msstate.edu. If I feel it is appropriate, I'll include it in my next update.